"It has often been said that there is no sentiment in football, but I believe that my career, at least, has proved that wrong. Every Scot is proud of his heritage, but I am equally proud to know that in the city of my adoption I am accepted as a fellow-Liverpudlian. It hardly seems 22 years since I was being warned about the "terrible" city which has meant so much to me. I cannot recall who said that a city is not just bricks and mortar and fine buildings, it is the people in it, but it expresses what I think. I would like to take the opportunity of thanking the much-maligned Liverpool supporters for the encouragement they have given to me. I have always been happy at Anfield for I know we have the staunchest bunch of supporters in the land. I do feel that the Kop is very biased at times, but in this sport which is fast becoming commercialised, the fans have a part to play in the team's success. The Kop crowd certainly have done their hardest to cheer Liverpool back to its rightful place, and I hope they will be able to achieve it this season, even though the club's start has been a disappointing one. I would like to think when I finally retire at the end of the season, Liverpool will be back in the First Division. Although my testimonial game is staged to-night, I hope I will still have the chance of helping Liverpool to reach their elusive target." 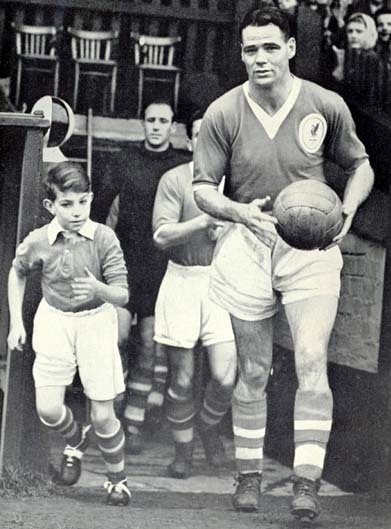 - Billy Liddell on the eve of his testimonial on 21st of September 1960.